A fantastic new video from the Hello Kitty Online team! HIghly recommended, the music is great! Uh Oh, it’s the Alien lifeform arrived in edible sweet cuteness! Hello Kitty Jell-O! That is in itself not news, she’s been wearing loads of kitty stuff but this dress is remarkable I thought! Here is the very original King Kong climbing that all american building and knocking down whatever he can. and here below is My Melody, who is doing her utmost to compare to the GREAT KING KONG, but she’s still trying to get up there (I don’t think she ever makes it does she?) and that flower pot is just adorable on the top. She does seem like she is struggling a little bit there but she’s doing her darnest in climbing that steep Eiffel Tower, painted all pink Hello Kitty Online style! Of course, not to be outdone, King Kong saw this act and decided he must emulate it not to beaten, he not only climbs it, he’s doing it with Attitude (see him laugh). Course, the great KING KONG is so great and big, he’s almost hanging out of the Eiffel Tower, guess My Melody is still a whole lot cuter and smaller than we all thought. But you can see KING KONG laughing (probably thinking to himself “har har har, I am still the greatest”), hang in there Mr. KONG, you do that for much longer and it’s going to be the leaning tower of Paris. Pictures that make no sense at all and that is why it’s great! I like nonsense, it wakes up the brain cells. Fantasy is a necessary ingredient in living. It’s a way of looking at life through the wrong end of a telescope. Which is what I do, and that enables you to laugh at life’s realities. Happy Valentine indeed, from Feb 12 through Valentine Day Hello Kitty Online mmo will go live once again for everyone to play and see and check out! Get your game here! No one expected to find Donna Molnar alive. Donna Molnar’s body temperature was 30 degrees Fahrenheit when rescuers found her Monday. Alongside his search-and-rescue dog Ace, Ray Lau on Monday tramped through the thick, ice-covered brush of a farmer’s field, not far from where Molnar’s van had been found a day earlier. Lau rushed to his Dutch shepherd’s side. "There she was, there was Donna, her face was almost totally covered except for one eye staring back at me!" he said. "That was, ‘Wow!’ There was a thousand thoughts going through my head. It was over the top." Then, rescuers got their second shock. "She was lucid, and said, ‘Wow. I’ve been here a long time!’ and then she apologized and said, ‘I just wanted to take a walk, I’m sorry to have caused you any trouble,’ " said Staff Sgt. Mark Cox of the Hamilton Police Department, one of the leaders in the hunt. "And we’re all thinking this is incredible, this is really something." "I’ve been doing search and rescue for seven years, and this is the wildest case I’ve had in finding someone alive," he said. She was rushed to a hospital and immediately sedated to begin the agonizing steps of hypothermia treatment. "I think the snow must have worked to trap her body heat, and that’s what really saved her," Cox said. "This really speaks to what’s possible." David Molnar is calling his wife’s survival his "Christmas miracle." He wasn’t able to speak with her immediately after she was taken to the hospital. But while she was under sedation, he leaned over her and whispered in her ear, "Welcome back, I love you." "My wife, you know, doesn’t pump iron. She is strong physically and spiritually," he said. "When people say to me how do I explain how she survived, I said I believe God reached down and cradled her until the rescuers could find her, because there’s no rational explanation." In addition to hypothermia, Donna Molnar is being treated for severe frostbite, and her recovery will take months. But his wife’s condition was upgraded Wednesday from critical to serious. "That may not sound like a great thing to everyone, but to us, that is the best news we could possibly get on Christmas Eve," David Molnar said. As for Ace, he’s still awaiting his reward: a T-bone steak. It’s the least that can be done for a dog who, in his own way, paid it forward. 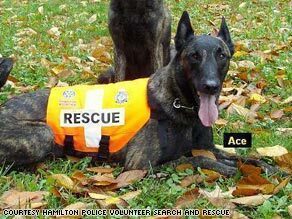 "A while ago, Ace was rescued from a home where he didn’t belong, and now he got to rescue someone. I can’t describe the magnitude of that, what that means to me," Lau said. "He’s definitely getting his steak. I’m grocery shopping right now." You are currently browsing the archives for the Cute category.